The Boston Globe reported that the Boston Police Department's police review board is now in place and ready to take cases. Some people may be criticizing the police control of the process of this review board, but what I see is Mayoral control all over the place -- appointing all the members, having them report annually directly to him, and the right of the Mayor to unilaterally terminate the board altogether. That's not accountability; it's Mayoral meddling. Let's have a police review board with the independence to pursue cases of misconduct reasonably without having to worry about getting canned by the Mayor if he doesn't like what they're doing. WGBH will conduct tests of the 30-foot light emitting diode (LED) screen on the outside of its new, all-digital studio complex in Brighton. To be conducted during off-peak commuting times throughout the day and evening, the tests will involve displaying colors, test patterns and images on the screen, which will be visible to eastbound commuters on the Mass. Pike from up to two miles away. 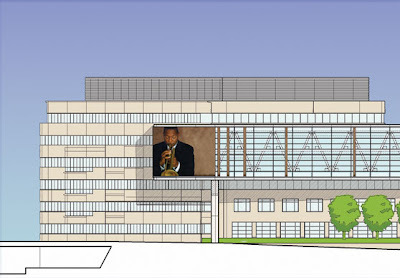 Scheduled to become operational in mid-September—when WGBH formally dedicates its new studios—the 30-foot by 45-foot screen will display slowly changing images that evoke WGBH’s award-winning science, history, public affairs, lifestyle, drama and children’s programming. The images will change each day, with additional information and background on the day’s chosen image available on the WGBH Web site at www.wgbh.org. The A-B TAB reported on the hearing last week in front of the Boston Landmarks Commission (not the Boston Redevelopment Authority, but in the BRA's Board room) for the owner, Dan Yu, of the historical property at 1954 Commonwealth Avenue. He apparently had received a citation from Inspectional Services for a branch that was overhanging the sidewalk. He responded by cutting down many trees on the property, some as tall as approximately 80 feet, and was issued a violation for doing so illegally without a permit. He also appears to have installed new windows on the house without prior approval of the Landmarks Commission. Neighbors suspect even more work being done without a permit, based on the traffic in and out of the building each day. As a result, the [Landmarks] Commission will conduct a site inspection to assess the damage before deciding what action Dan Yu, the owner of 1954 Commonwealth Ave., needs to take. Most likely, the commission will tell Yu to replant some of the trees and landscaping he cut down, said Kate Neuner, a preservation planner for the Landmarks Commission. New Poll: What is the most important issue facing Allston-Brighton? What is the most important issue facing Allston-Brighton during this election cycle? The question is located at the top of the right-hand sidebar on Brighton Centered. People who read this blog using an application (Google Reader, aggregator, etc.) will have to load the full website in a web browser in order to see the poll and vote. It's been two-and-a-half months since Councilor Jerry McDermott announced that he would not seek re-election to the Allston-Brighton District seat on the City Council. Six candidates have since entered the race, assembled campaign staff, researched the issues, raised money, knocked on doors, and setup websites. How well have the candidates established a presence on the internet? The answer: functional to lousy. You would think that these days, in the internet age, the candidates would consider an effective website as a key element of a campaign. In last Monday's candidates forum, Tim Schofield even berated the transparency of the current City Council for failing to provide on the internet the text of resolutions and ordinances currently under consideration. He said, if the City Council won't post the documents on their website, then, as a City Councilor he would put it up on his own. Let's not pray for a shadow government on the internet, but rather ask how adept our candidates seem to be with the web. Three candidates had websites up in short order: Alex Selvig, James Jenner, and Tim Schofield. All three have modest amounts of content on them, and have had the occasional update to add content (like media links). Schofield had his website http://www.timschofield.org/ presumably left over from his run for State Representative in 2005 (and continued to pay the bills in the interim), but has seamlessly linked that site to his newer one http://schofieldforcitycouncil.com/ . Jenner needs to learn the how to use the "title" tag in HTML... his pages currently are labelled as "Untitled Document". Two candidates have put up placeholder websites only very recently: Mark Ciommo and Greg Glennon. They have the famous phrases -- "Coming Soon" and "This site currently under construction" -- that used to be found on 95% of all websites. The email address listed on Ciommo's website bounces back to the sender, while Glennon's site doesn't list an email address at all. One candidate, Rosie Hanlon, has a website but hasn't even parked a single page at it to tell you it will be coming soon. This all despite the fact that the web address is listed on her campaign literature, and has been that way for at least several weeks now. Ciommo and Hanlon both know some clever teenagers who could probably help them put up websites in a few hours. Anything would be better than the current contents. Ciommo's story is the most curious one: early campaign literature sent to me (with a very nice, hand-written note!) 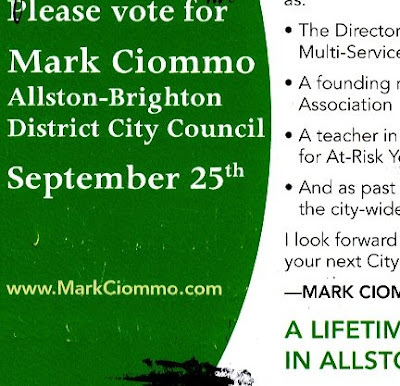 listed the website to be at http://www.markciommo.com/ , not his current "official" site of http://ciommoforcitycouncil.com/ . Quick investigation on "whois" shows that the latter is owned by somebody probably working for him, while the former is owned by somebody else in Arizona (probably a third party disguising the real owner). That is a tough lesson for Ciommo to learn: you should always buy the web domain before sending out campaign literature. He committed a "rookie mistake" -- but, strangely enough, Ciommo has run for the seat before, while neither of the two "rookies" in this race (Jenner and Selvig) made this mistake. More likely it is a sign of a generational gap. Tim Schofield and Alex Selvig have setup links for campaign contributions via PayPal, the obvious -- and simple -- way to accept money over the internet in the age of Ebay. None of the others has a way to donate online. James Jenner and Tim Schofield have blogs, but both have had so few postings that they are sure to disappoint visitors. Jenner took the simple and free route of using Blogger for his hosting service (just like the cheapskate who owns Brighton Centered), while Schofield has had a more clever web guru integrate his blog onto his website. All-in-all, I find the candidates' use of the internet to date to range from functional (Schofield and Selvig) to poor (Ciommo, Hanlon, and Glennon). I hope to see some improvements between now and the election. A lot. This does not bode well for improving a City Government that has a mediocre website lacking in many key documents (e.g., City Council ordinances, BRA regulatory filings, etc. ), having portions of it that don't work properly (e.g., ISD online complaints under at least some browsers and/or OSs), and missing key directories (e.g., of all city employees in a given department!). The best way to find out who works for the City of Boston? The Boston Herald's payroll database (despite its incomplete information). That should not to be the case. The next City Councilor should be someone who can lead the City into the electronic age of the 21st century. Let's hope the candidates can fix up their websites to show us who among them is best suited to fix up the City of Boston's website. NOTE (July 30, 2007; 1:30 pm): I have been notified that Rosie Hanlon's website is now up and running. There is no way to contribute online. It also contains a blog, although that blog (created "July 2007") has no entries yet. It's nice to see that a little prodding appears to have led to the website's launch! NOTE (July 30, 2007; 6:00 pm): And now Rosie's blog has its first posting. Bravo! Editorial note: As I have told many of the candidates already, I do not plan to endorse any candidate in this year's election. Newspapers can separate editorial endorsements from their reporting, but a humble blogger cannot to so with any credibility. In a similar vein, I have not, and will not, be making any personal financial contributions to any candidates. Limited announcements of campaign-related events will be made on Brighton Centered, but only when there is more than one campaign having an event -- or if the event literature itself becomes newsworthy. Campaign flyers are being posted only when the candidate braves the tricky dangers of the porch stairs and the mastiff answering the door of the New England Headquarters of Brighton Centered. My goal is to bring to the public a wealth of information on the candidates, their campaigns, and the issues that are important to our community. Investigative reporting -- to the extent feasible by a lackey with a full-time job -- will be pursued without bias towards, or against, any particular candidate. Unabashed opinion can then be offered with the personal guarantee that I am neither supporting, nor committed to, any candidate in the election. It is in that spirit that I offer critical analysis and opinion pieces in the days to come. There were a number of reports during the last two days of "get-out-the-vote" drives: requests to vote on the candidates forum poll I put up a couple of days ago. I estimated a bit under 100 people attending the forum, while the A-B TAB put the number at 75. There are always some people who don't do email, others who don't do the internet, many who haven't ever heard of a blog, others who think Brighton Centered is a pile of dog doodoo to be avoided at all costs, etc. So you can't expect all those attendees to make it to the blog to vote. When the number of voters today (105) exceeded the number of people in attendance at the event, it was clear that the poll results have been manipulated. The results are meaningless and clearly not representative of the public's feeling on who did well in the forum. I notified the campaigns not to use the results in any literature, by the way... and other media should be similarly warned. We'll chalk this one up to a bad experience. Maybe we can expect 75,000 votes to be cast in Allston-Brighton in the September 25 election? It would be interesting, because the neighborhood only boasts 70,000 residents (and far fewer registered voters). I'm all for the Chicago method of getting out the graveyard vote! Corrections? Email me with them to pahre@comcast.net . Main Streets. I also want to thank Jack Fucci for hosting this forum. Tremendous thanks to our Senator Steven Tolman. you have great commitment to this community, as do I.
here in this room can say, yes, "If you need something, go to Rosie. She can do it." And here's a couple of examples. sneakers, the walking club was created, they lost weight. down to only a couple. thank God we have a Teen Center -- got the kids up to Brighton Center. going to them and saying, "Thanks guys, this is pretty awesome." that they created is something that they can look at all summer long. They can be proud of this. And so can we. -- it's an old saying that many of you are familiar with. the powers that be and get the results that we need. up in my administration to preserve what we have left of our history. kids off off the street with after-school programs. campaign. Thank you very much. hear all of us speak. investigating and prosecuting public corruption in Toronto City Hall. the doors of registered voters in Allston-Brighton. is what you get. There is no B.S. here. anywhere else. And I hope to raise a family here. that's where I turn the page. lawyers, developers, or any lobbyists. I am a citizen just like you. wind is blowing and how to adjust my slate so that I can get elected. this neighborhood deserve a lot more credit than that. all of us in Allston-Brighton, please vote for me on September 25.
vacation right now. They would be really bummed out. [??] alternative high school program. Coach of many youth sports teams. Allston-Brighton needs strong, bold representation at City Hall. coming out, this is a great turnout, this is an important election. community with diverse neighborhoods, with lively business districts. and evidenced by every meeting that occurs in this neighborhood. We live in a great neighborhood, but we are facing serious challenges. the experience to be an effective advocate for this community. I am running for City Council because we do live in a great community. and economic development, between good schools and a stable community. what I do. I frequently represent people who have no other voice. advocate for this community at City Hall. putting this impressive event together tonight. do, is it something that I can do? And why do it? people, and to make a difference. be assigned by DA Dan Conley as the supervisor in that court for him. vulnerable in our society, those who struggle with addiction issues. To fight for people who don't have a voice. College and Harvard. And there is this anxiety out in the community. voice, and not an echo. and sidewalk and other improvements. go to work for this community, the Allston-Brighton community. way in helping to solve a lot of these problems. euphemism for rent control and would you vote for it? generally go down as a result. is, that the City Councilor be a unifying force for the community. community meetings. Residents of certain areas may want it. think the best thing to do that. and finding halfway homes and treatment homes for our kids that do. education out early on in the schools to address this in prevention. address it, attack it, and make sure that our kids are safe. on because they aren't addressed. A lot of times "politicians"
always addressed, and the issues aren't always made important to them. Because of that, they feel like they don't really have a need to vote. is because things like what's going on in our community happen. national politicians. I hope that I do that in this election. QUESTION: What do you have to offer that the other candidates do not? last 20 years, I have been involved in many levels of this community. neighbors together to improve the park, make it more family-friendly. like I've been able to have. would you go about acquiring more open space? have to do is enforce the zoning that we have. [inaudible] to bring our community together on those issues. have tried to recruit businesses. little flux right now -- 95, 90% fully leased. That's a big deal. time? We really need to do something about this green space issue. community for that to happen. previous question and answer that, allowing a little bit of liberty. to know your local shopowners. more, it's really important, it's really important. energized and so exhausted at the same time. It is truly wonderful. different place in Brighton Center than it was when I was a child. us who have been around a while will remember. I'm glad they're gone. -- we, we as a community can determine together what to [do with them]. couple of important issues about honest and accountable government. neighborhood and we hear of those. and they can't even find them online. can navigate on the web and they can come in, get the information. Certainly as well in the mail from me, from my office. this not happened, and what would you do about it? home taxes -- we need to make them work for us and our community. JENNER: Comm Ave's a mess, and that's the fat and simple truth. fund would go a long way towards that as well. successful. She was kind enough to sit down with me for a morning. of money off of these properties, and aren't being held accountable. Part of the problem is Inspectional Services needs more resources. have enough resources on the street that those calls are responded to. institutional expansion that is taking place in the area? it has come up a few times tonight, we have a very active community. one of my top priorities, to serve as that link between those two. partner. I'll organize meetings that find answers and find solutions. people have to say. And what are the priorities of the organization. Jerry McDermott, the current City Councilor? TOLMAN: Alex, is there something you want to tell us? Alex? universities, the turnpikes, the institutions, and other development? training, this is what I do. with. Reconcilation is very important, as well. I'm trained in this. year-to-year, every year, that I had to deal with. role of moving City Hall? cutting-edge green City Hall. But that's a question of resources. not support moving City Hall. would not support a relocation to the South Boston neighborhood. do as your City Councilor. the process at Harvard, is a fait accompli. school assignment in East Boston, so the For Sale sign is up. Somebody asked me, who has the most yard signs up in this campaign. are yard signs from local realtors. People are leaving the City. Property taxes are up. We just heard water rates are going up again. who frequents local establishments -- and which I absolutely oppose. I'll take with me, and the issues I'll fight for. as I knock on doors, go to civic meetings, go to the coffee shops. for your support. And I thank you very much for coming out tonight. continues. Thank you very much. issue that wasn't one of my questions during my five minutes here. those fines a surcharge on property taxes so we can get those paid. strong, effective leadership right now. have our schools, too, they have public schools, too. Cleveland Circle is beautiful. There are wonderful places to live. reason that more families can't be moving into this community. integrate them -- that's an important part of our future. business owner. We need someone who understands these complexities. your vote, to be able to do that. Thank you very much. because of more of the student party houses and things like that. changed. We have to know what's going on across the street from us. and has to be brought out into the public. The BRA's process right now doesn't do that, and it must be changed. no requirement that they listen to us. It is [inaudible]. do that, wouldn't we, if we worked for Harvard? and the energy to protect Allston-Brighton. Thank you. very, very good of you, Alex. that I live right around the corner. Harvard has it's issues as well. I'd like to go into a little bit of history here in terms of Harvard. they want to stay there, they should be allowed to stay there. have to move if they don't want to move. softball stadium. The projected revenues: give us 10 percent of it. suffer the loss of a large green area and not get something in return. they should contribute time as well to improving the infrastructure. between 1990 and 2000 census, while the entire City itself went up. going on with the development. England to come from here for this debate. continue to do that, and more. much for taking the time tonight.